Plantronics .Audio 470 USB Computer Headset - Headsets Direct, Inc.
.Audio 470 Computer Headset has been discontinued. The Plantronics .Audio 470 USB’s innovative foldable design lets you productively use commute time or simply relax with music or a DVD during downtime. Stow it in your laptop carrying case or briefcase and go. Optimized for Internet calling with Skype, Windows Live, or Yahoo Messenger, the adjustable boom can be positioned close to your mouth so that callers can hear you clearly. Enjoy music, a DVD, or a Podcast in full-range stereo. 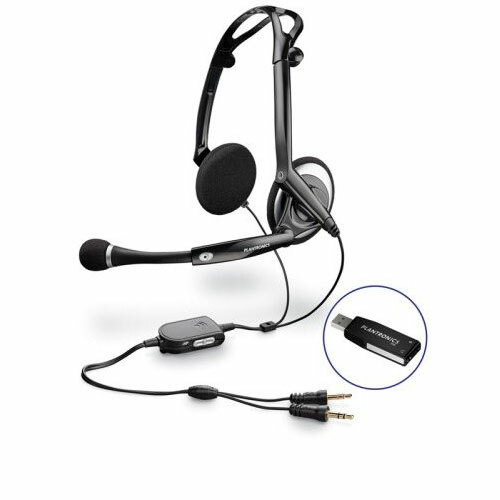 A choice of analog or USB connection makes it easy to plug and play, while the adjustable, lightweight headset provides hours of comfortable use.